Support us! The best way to support our group is to attend our fundraising sales and buy art. Follow us on Twitter for updates and special events. To donate directly to the Farmer's Loan Fund, please contact our Founder, Alan Mart. To support Marin Organic directly, please consider becoming a member of Marin Organic. Artists, photographers, and those wishing to gather inspiration for art works inspired by Marin Organic Farms may participate by signing a waiver, and attending our pre-arranged farm visits. As soon as we arrange visits with farms, we will post the dates on this site, and email information to all artists. Since 1998, we have operated as an all volunteer, free-of-charge group. To keep this going on, we request that artists step up to volunteer for roles when they can, such as taking on the responsibility to hang signs at a farm visit, or remove them at the end of the day. Assisting with installation of shows and gallery sitting is required, as well as assistance with hanging posters, creating postcards and any PR needs that arise when we are promoting our annual fundraiser shows. During these shows, we request that 50% is donated to the Marin Organic Farm Field Studies Program at Marin Organic. We truly encourage all artists to become Members of Marin Organic. If you do become a member of Marin Organic, we will feature your art in a featured post on our blog here at "Art on the Farm" .com. A great way to share your work with the online world, promote a show or event you are having, and encourage others to do the same. 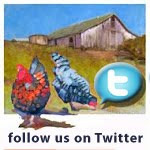 If you wish to become an "Art on the Farm" site for art inspiration and creation to our group, please contact Alan Mart. Artists enjoy meeting the farmers when they can, but are also fine to explore the land, quietly on their own. You may dictate the needs and requirements to Alan, who will relay the details to our group. For additional support, you may also contact Colleen, our local artist liason + communications volunteer. Go Art on the Farm! It rides again into a brand new year! Kudos to Larry for being a work horse for so long. The baton is passed to all of us now, to carry this wonderful group along.